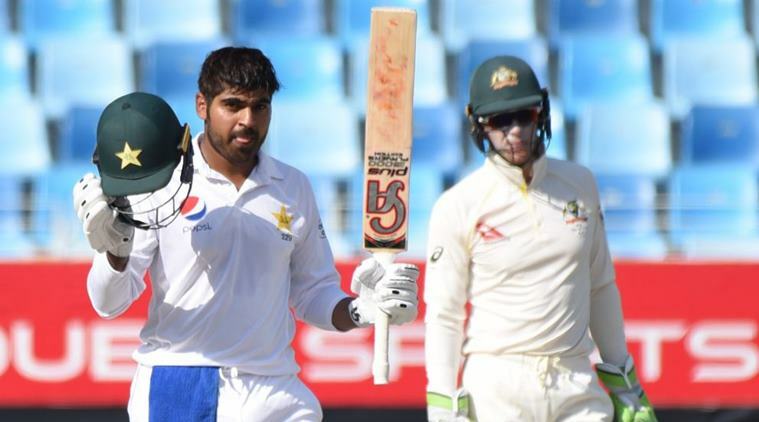 Pakistan dominated proceedings in the first Test against Australia in Dubai after posting 482 runs in the first innings thanks to Haris Sohail’s maiden Test century on day two. Sohail led the Pakistani charge against Australia with his maiden century in his sixth Test to help Pakistan post a dominant 482 in the first innings at their adopted home ground in the UAE. As the second centurion in the Pakistan innings (after opener Mohammad Hafeez’s earlier 126 runs), Sohail showed no signs of succumbing to a nervous-nineties dismissal, smashing a massive six over mid-off while on 92, before glancing a Jon Holland delivery to third man to reach triple figures. His eight fours and two sixes will form most of the highlight reel for the second day as he worked his way to 110 runs off 240 balls before being dismissed in the final session of the day. Australia started the day off on a positive note with Peter Siddle’s dismissal of nightwatchman Mohammad Abbas (one run off 26 balls) within five overs of the start, with a beauty that beat the outside edge of the lower-order batsman’s bat before crashing into his off-stump. The Aussies then had to toil hard for the second day in a row as Asad Shafiq and Sohail came together for the fifth-wicket and posted a defiant 150-run partnership. Shafiq played beautifully throughout his innings as he accumulated nine fours and one six on his way to 80 runs off 165 balls. He was mightily disappointed to lose his wicket to the part-time bowling of debutant Marnus Labuschagne just before the tea interval. The South African-born Labuschagne (who now uses the colloquial Australian pronunciation of Labu’shane’) was impressive with both the ball and on the field as he bowled the perfect leg-break delivery to induce the nick from Shafiq straight into Aussie wicketkeeper and captain Tim Paine’s gloves. Labuschagne partnered up with Paine again to run out Babar Azam, who was slow to react to a call for a single from Sohail, which reduced the home team to 418-6. Labuschagne nearly picked up a second wicket off his tidy part-time wrist-spin, but Aaron Finch couldn’t hold onto the opportunity at first slip to dismiss Pakistan’s captain Sarfraz Ahmed. Sohail and Ahmed (15 off 28 balls) took Pakistan to the 450-mark before Nathan Lyon returned to the attack and got rid of the troublesome left-hander Sohail to finish with figures of 2-114 off 52 overs – his longest bowling spell in Test cricket. Australia had finally dismissed Pakistan for 482 runs after more than 164 overs in the gruelling heat. Australia will resume their first innings on Tuesday on 30-0, with Usman Khawaja and Test debutant Finch at the crease.